(Nanowerk News) New optics research from Rice University's Laboratory for Nanophotonics suggests that tiny gold particles called nanostars could become powerful chemical sensors. The findings are available online and due to appear in an upcoming issue of the journal Nano Letters. Nanophotonics is a rapidly growing field of study that looks at ways to generate and manipulate light using ultrasmall, engineered structures. 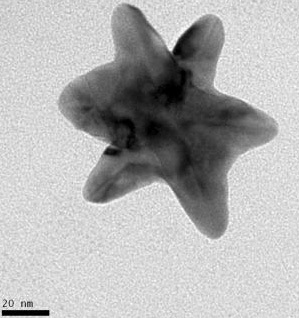 The virus-sized nanostars, so named because of their spiky surface, are one of a growing number of intricately shaped particles that are increasingly drawing the attention of experts at LANP and other leading photonics labs. "Just a few years ago, everyone's attention was on the size of nanoparticles because altering size was a straightforward way to change the wavelength of light that the particle reacted with," said lead researcher Jason Hafner, associate director of LANP and assistant professor of physics and astronomy and of chemistry. "Today, researchers are increasingly interested in intricate shapes and the specific ways that those shapes affect a particle's interaction with light." Most nanophotonic research at LANP involves the study of plasmons, waves of electrons that flow like a fluid across metal surfaces. Light can be used to amplify plasmon waves on metal nanoparticles. Like a child in a bathtub, rhythmically building waves until they slosh out of the tub, the plasmons on the particles dramatically amplified with wavelengths of light that correspond to the rhythm of the electron waves. The study of plasmonics is one of the fastest growing fields in optics because it could prove useful for a wide range of applications in biological sensing, microelectronics, chemical detection, medical technology and others. "LANP is building a broad-based plasmonics research program at Rice, and our recent cutting-edge work on novel structures like nanostars and nanorice is a clear indication of leadership we're building in this field," said LANP Director Naomi Halas, the Stanley C. Moore Professor of Electrical and Computer Engineering and professor of chemistry. Nanostars incorporate some of the best properties of oft-studied photonic particles like nanorods and quantum dots. For example, they deliver strong spectral peaks that are easy to distinguish with relatively low-cost detectors. But Hafner's team found unique properties too. A painstaking analysis revealed that each spike on a nanostar has a unique spectral signature, and preliminary tests show that these signatures can be used to discern the three-dimensional orientation of the nanostar, which could open up new possibilities for 3-D molecular sensing. "We are just getting started with our follow-up work, but nanostars clearly offer some exciting possibilities," said Hafner, assistant professor of physics and astronomy and of chemistry. "Their extreme sensitivity to the local dielectric environment is a particularly attractive quality for molecular sensing."